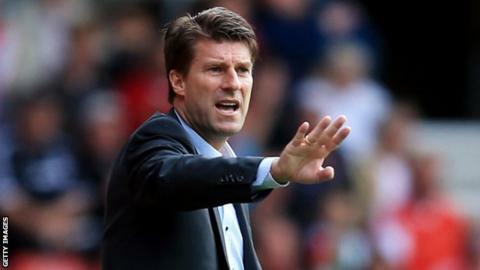 Manager Michael Laudrup says Swansea will show no fear for their visit to high-scoring Manchester City in the Premier League on Sunday. Manuel Pellegrini's City side have scored 41 goals in 10 home games in all competitions this season, including a 6-0 defeat of Spurs and a 4-1 win against Manchester United. "They are the best home team in the league," said Laudrup. "We will show them respect but never fear - you can't play with fear." City's impressive home form has seen them score 26 goals in six home games in the Premier League and Laudrup admitted: "It'll be a tough afternoon, but we can only surprise them." Laudrup will be without strikers Michu and Wilfried Bony for the trip to the Etihad Stadium. Michu has not played since the 1-0 defeat at Cardiff because of an ankle injury while Bony damaged a hamstring in the Europa League loss against Valencia on Thursday. However, Spanish winger Pablo Hernandez is available after returning to action against Valencia. The 28-year-old former Valencia player's season has been badly hit by a thigh injury, with Thursday's substitute appearance only his second appearance in two months, and he is eager to repay Laudrup for the faith he has shown during the winger's recovery. "This has been the worst period of my career," said Hernandez. "Before I had injuries where being out for three weeks or one month was the worst I have had. "After the West Ham game, I had recovered from the first injury, I played 30 minutes and I felt good on the pitch. "Two training sessions later I went to take a shot and the injury went again. That was very, very hard for me but Michael always helped me, he spoke with me and supported me - he is very important to me." Another selection issue for Laudrup is at left-back where the Wales international pair Neil Taylor and Ben Davies are vying for selection. Taylor, who was selected against Valencia in midweek and was also preferred by Wales manager Chris Coleman for the national team's friendly against Finland, believes a trip to Manchester City is currently the "greatest challenge" in the Premier League. "They're expansive and they're playing really well. Pellegrini's teams are all or nothing, and at the moment it's the former," he said. "Spurs were under par against them last week, but with the players they've got like Aguero, Edin Dzeko and Negredo, they've got four or five front players who would get in any team in the Premier League."